When it comes to perfecting your smile, few dental procedures are as effective as the placement of dental implants in Long Island. Famed for their incredibly realistic appearance, comfort, and health benefits, dental implants have been used by periodontists to restore form and function to smiles since the late eighties. However, better materials, imaging techniques, and treatment practices have made getting and maintaining implants easier than ever before. Here is a little more information about dental implants, so that you can decide if they are right for you. Simply put, dental implants are artificial tooth roots designed to hold a permanent crown. Created from durable titanium that is made to mimic the natural texture of your jawbone tissue, these posts eventually fuse with your jaw to create a stable biting surface. Implant crowns can be designed to completely alter the look of your smile or to blend in perfectly with the surrounding teeth, depending on your wishes. Because they create such a strong support system, dental implant posts can also be used to secure partial bridges. Good candidates for dental implant surgery should be committed to maintaining their oral health, not smoking during the implant placement process, and keeping their bodies strong and healthy. Additionally, since certain medications can impact the way the bone heals, Dr. Scharf will carefully evaluate your medical history and previous prescriptions to determine your personal level of risk. Patients who are interested in dental implants should also be treated for conditions like bruxism, since tooth grinding can interfere with healing and damage the final implants. Although many dentists advertise the placement of dental implants, there is no law that prohibits dentists from practicing outside of their scope of expertise. This means that although your family dentist might be willing to place your implants, they might not have the formal training and experience necessary to place your implants safely and effectively, which can extend the process or lead to an undesirable result. However, as a board certified periodontist, Dr. Scharf has received years of additional formal training in the placement and maintenance of dental implants. 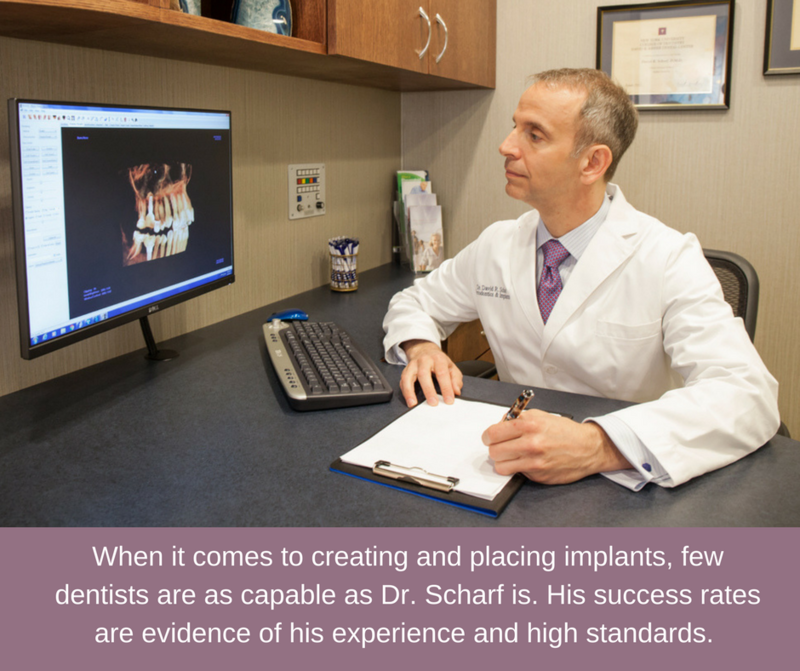 Dr. Scharf has also a highly esteemed teacher, lecturer, and scholar on the topic of dental implants, helping him to offer a level of service that can’t be beat. After you have met with Dr. Scharf and have undergone a dental exam to determine your candidacy for the procedure, he will create a personalized treatment plan for you. Some patients require prerequisite surgery like bone grafting or extractions before implants can be placed successfully. After the area has healed and is determined to be healthy enough to hold an implant, you will be asked to come back to have the dental implant post placed. During post placement, the entire area is completely numbed with a powerful anesthetic. Post healing and integration with the jawbone tissue can take between 4-6 months, but after the area has healed, you are ready to have the final crown cemented to the implant. Impressions will be taken and your dental crown will be fabricated, and after it is cemented to the post, your transformation will be complete. Dental implants offer a long list of powerful benefits, but probably the most important one is the fact that they prevent bone loss. Most people don’t realize it, but when you lose a tooth, your jaw tissue starts to resorb, or melt away. This process occurs quickly, with the bone ridge losing as much as 25% of its width within the first year following the loss. However, dental implants stimulate the jaw, keeping it healthy and preventing bone loss. Additionally, dental implants are easy to keep clean, incredibly durable, and capable of lasting a lifetime. But Wait… Aren’t Dental Implants Expensive? Oftentimes, patients who are considering dental implants are nervous about the expense of the procedure, especially since dentures and partial bridges are a fraction of the price. However, because dentures don’t protect against bone loss, most people have to replace them every five years or so, which drives up your total treatment cost. On the other hand, dental implants are a beautiful, permanent solution for missing teeth, saving you a lot of money in the long run. In fact, because they work so well and can last for the rest of your life, dental implants are an incredibly economical solution for tooth loss. 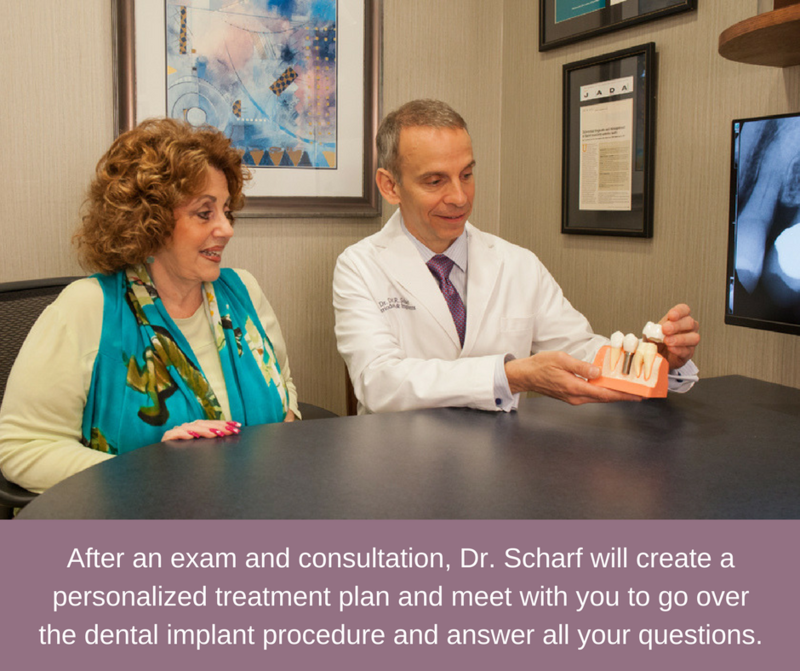 If you have been thinking about dental implants and would like to speak to Dr. Scharf about them more, then please give us a call and schedule an appointment to learn even more. Dr. Scharf understands that every individual case is different and you have specific questions that pertain to you. His experience and expertise are the best in Long Island, NY and he will be able to work with you in finding the best outcome for your situation! We look forward to speaking with you and helping you achive a confident smile!